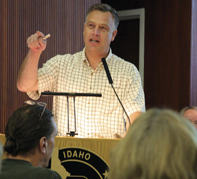 The Idaho Transportation Board next week will consider a request of nearly $5.5 million in funding for enhancement projects under the American Recovery and Reinvestment Act of 2009. Those enhancement funds are in addition to the $182 million allocated to Idaho for “shovel-ready” highway construction projects and $18.4 million for transit projects. The month of May brings images of daffodils, tulips and other early spring bulbs, as well as the color of green returning to lawns and trees. In Idaho’s high country, however, white still dominates nature’s canvas as the remnants of winter’s snowpack slowly turns to spring runoff. For ITD’s avalanche team, May 1 signals the end of digging snow pits and collecting data, and preparation of a season-ending report. It’s not like dragging an old boot from their favorite fishing hole, but members of the Kelly Creek Flycasters find their share of interesting items when they clean the shoulders of U.S. 12. The Lewiston-based fishing group adopted a two-mile section of the highway (between mileposts 158 and 160) because they camp and fish on the nearby Lochsa River and want to maintain the area’s pristine beauty – dry land and water. Walter Burnside still busted out in song and Dianna Schlund got an expensive present, but it wasn’t anybody’s birthday. More like hundreds of years of ITD experience being rewarded. Thirty-two individuals were recognized on during the District 4 Employee Benefit Fund Longevity Awards luncheon. Twenty-eight others received their 2008 safety awards. Open enrollment continues through June 3. During Open enrollment, employees may switch from one medical plan to another, add previously declined dependent dental coverage, change their pre- or post-tax premium withholding status, or enroll/re-enroll in the Flexible Spending Account program. The 2009 legislative session (concluded) today after a difficult year of revenue shortfalls, stimulus funding and transportation issues. Throughout this session you and your staff have continued to deliver outstanding service to the citizens of Idaho. During the session there was a great deal of discussion on the issue of funding for state employees. Employees at Headquarters paused to appreciate each other with a variety of other activities, including educational presentations in the Auditorium, free chair massages, a pasta lunch, cake and ice cream, a fitness walk, prize drawings and a “dress like your favorite personality” event.